We take a close look at 5 of the leading DAW control surfaces. Find out how they perform, and which we recommend in each budget category. Mixing at home is great until you realize just how limiting a computer and mouse can really be. That's where a DAW mix controller takes things to the next level of speed and convenience. Record and mix just like the pros do, and see your workflow streamlined like never before. In today's article we review the best DAW controllers for every budget. Should you be running a tight ship money-wise or are ready to splurge, we've got you covered. There's even a handy buyer's guide for any first time buyers. Start by comparing the key features in the comparison table, before we take a closer look at the performance in the reviews that follow. See how they compare at a glance. Each category can be sorted. Click on the images to find out the latest price. 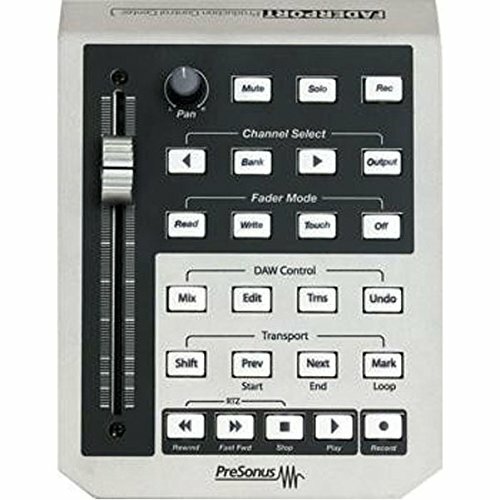 The PreSonus FaderPort caters to those that require the dexterity of of hardware controls, but don’t have the space or budget for a huge multi-fader controller. It offers all the important features in a compact box just 7″ x 5.25″ in size. It’s the perfect console for the home recording enthusiast looking to upgrade their set-up and boost their productivity and creativity. 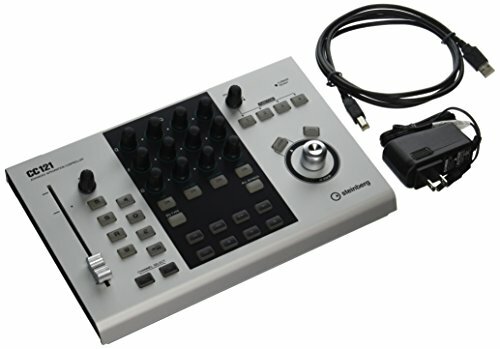 The interface includes a single motorized fader, a small knob for panning, and 24 buttons. The buttons are illuminated in a variety of colors when being used, and 5 of them are transport mode buttons. An important thing to note is its compatibility. It’ll run nicely on both Mac and PC, and it can be used in unison with all the big DAW software available (it supports both Mackie Control and HUI control protocols). However, if you really want to see it shine then use it with PreSonus Studio One. The single fader can be used to control multiple channels, using the ‘Channel Select’ area of the interface. The forward and back buttons skip tracks in sequential order, while the ‘Bank’ button is great for larger recordings as it can skip in banks of 8 tracks. The fader controls the channel’s level as expected, and it can also be used to change the master output level too. The fader can be used manually or by using automation using the motor. The automation buttons (read, write, touch, off) are lit up when in use. The ‘Off’ button is a nice option to have listening back to the mix, as it kills the noise of the fader. Having one fader is an advantage for the obvious reason of allowing the device to be compact, but there are other, less obvious benefits on offer too. It can actually make the process less confusing as you always know which track the fader is controlling. The PreSonus FaderPort isn’t flashy or overcomplicated. It has all the necessary features at a button press, including the sought after automation. It’s connected by USB and also includes a foot switch input. A foot switch is perfect for hands-free operation, like when punch recording, but be careful that your DAW will accept it. 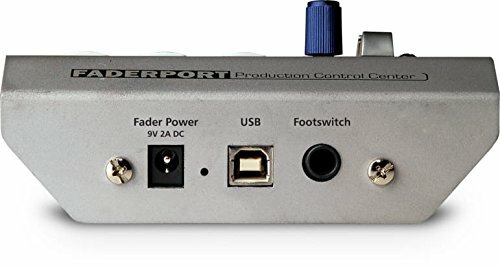 If you like the look of the PreSonus controller but need something with more channels, then check out its big brother the PreSonus FaderPort 8-Channel. It cones with high definition channel displays and even more functionality. Bottom Line: The PreSonus FaderPort's compact size makes it ideal for the home recording studio or for those that like to record on the go. The one fader set-up is also ideal for those just starting out. It's got all the essential functions to make recording a breeze, including fader automation which is a great inclusion at this price. If you're using PreSonus Studio One software then this is a must as it can be used to tweak pretty much any plug-in parameter that you so wish. The Korg nanoKONTROL 2 is what you would call a cheap mixing control surface. It packs 8 whole faders into something measuring just 14.5″ x 3.5 ” in size. It’s incredibly easy to use and the interface should be able to be mastered in just minutes. Now, the size of this thing alone might dictate the need to buy it. It’s so slim that it’ll take up less of that precious desk space than your keyboard! It will also easily fit into a backpack and weighs just 15 ounces. This is just as well suited for life on the road as it is sitting on a cluttered bedroom desk. Now the size of the faders might be a problem for some. They don’t allow the most accurate of changes to be made. In fact, the faders aren’t motorized and they can’t be grouped either. This means the nanoKONTROL isn’t good at recording automation. However, it is very highly thought of by electronic musicians. Korg are a big name in this area and they’ve designed the nanoKONTROL for this reason. In fact, when used in combination with the nanoPAD and nanoKEYS you have an amazing suite of tools that work perfectly in harmony to create electronic music with ease. The whole suite is very well priced and look great when used together too. A fader, knob, and 3 buttons are available for each of the 8 channels. They give the ability to change the volume, pan, mute/record/solo. A marker button also gives the option to highlight important moments in a song. Korg Kontrol Editor software is provided with the controller. This allows you to store detailed customized parameters for tracks, as well as for virtual instruments. In fact, the nanoKONTROL2 shines when paired with a software synthesizer. Parameters of the synth can be assigned to the controller for immediate customization. The faders may be used to change the ADSR of an envelope generator, or the knobs might be used to alter the resonance. The controller is easily paired with a computer using the USB connection. MIDI information is transferred the same way, so the desktop isn’t a mess of tangled wires. Bottom Line: This ones for the electronic music creators out there. The MIDI functionality and integration with Korg software and other hardware make this a powerful little controller. The size and portability make it a stand-out too. Oh did we mention how cheap is it? The Behringer X-Touch steps things up quite considerably from the last two reviews. Yes, it’s a lot pricier, but it brings a wealth of new options. 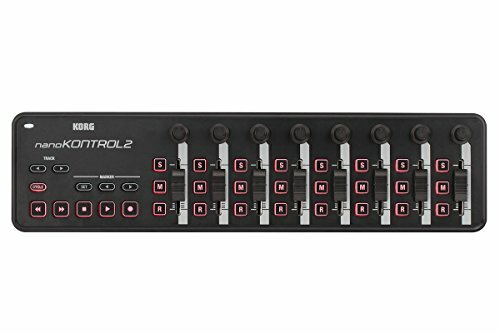 It’s actually very well priced when compared to other 8 or 9 channel control surfaces, and makes these larger controllers more affordable than ever before. If you like the look of the X-Touch but need something a little smaller then don’t miss its little brother the X-Touch Compact. Right off the bat, the key features here are the 9 motorized, touch sensitive faders, LCD scribble strips (fader labels), and the Ethernet/USB/MIDI interface. Another thing to note is that it supports both Mackie and HUI control. This means it works very nicely with DAWS like Logic, Performer, Cakewalk, and Pro Tools. Actually, it might well be the best control surface for Logic Pro X. Those touch sensitive faders make life so much easier with a larger desk like this. As soon as you touch the fader, the software automatically highlights the channel on screen. That means you can leave the mouse alone, as your work is streamlined like never before. Drawing automation is easier than ever too, using the motorized faders. The faders each have an 8-segment LED meter too, which makes monitoring channel levels nice and clear. The scribble strips are the labels at the top of the fader channels. These automatically display the instrument or channels name that you have given in the software. They also display parameter information. If you are adding EQ for example, it will show the band and the amount that you are cutting or boosting. Unfortunately, the scribble strips sit at a strange angle and they aren't easily read from a sitting position. This is more an issue with the orientation of the desk, and it can be fixed by tilting it up slightly. Each channel features a rotary control at the top of the strip. This is used to pan, but when you delve a little deeper it can be used to control a whole load of parameters like EQ. It can take control of whatever you have on screen in the DAW software. There are actually 92 buttons on the Behringer X-Touch. This makes it look a little cluttered, as it doesn't have that big of a footprint. Thankfully, the buttons are illuminated and color coded, but it will be a bit overwhelming at first for those stepping up from a smaller controller. However, the huge jog wheel is a joy to use, and makes you wonder how you used only a mouse for so long. The X-Touch uses a USB connection, and includes a USB hub including 2 extra USB ports. Included are also MIDI in and outs, two foot-switch inputs (1/4"), and an Ethernet port. Bottom Line: This is an affordable 9-channel desk. It's compatible with all the major DAW software, and has all the features you really need. The LED meters, nice faders, and illuminated buttons might fool you into thinking this costs a lot more than it actually does. It also integrates really well with the other Behringer X-series products. If you're looking for a Logic control surface then this one deserves your consideration. Now this is one good looking DAW control system But, thankfully that's not all it has going for it. It's an awesome piece of kit... expensive kit at that. 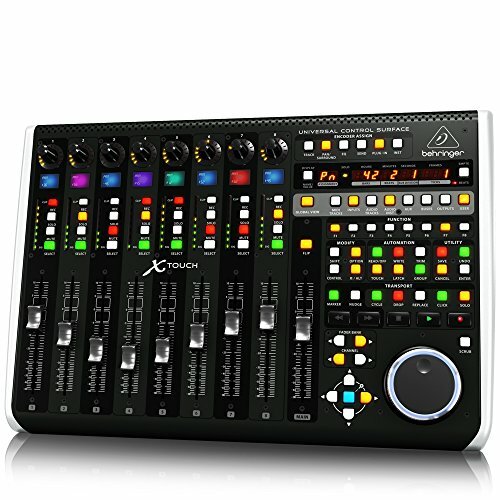 Compared to the similarly sized Behringer X-Touch (see previous review) the Artist Mix has a clean, intuitive interface that isn't crowded with buttons. But don't let its simplistic looking style fool you, this is probably the most powerful of the controllers we've reviewed in this article. If you're a Pro Tools user, this system definitely needs your consideration. It is THE Pro Tools control surface. The Artist Mix has 8 touch sensitive, and motorized faders. Select a track on screen by simply touching a fader. The Nudge and Bank buttons also allow you to quickly navigate through large mixes much more easily than with a mouse (one track or 8 tracks at a time). Each channel has a touch sensitive knob that can be mapped to control a variety of parameters. Besides panning, powerful plug-in parameters like EQ and dynamics can be quickly tinkered with. There is also the option to switch control from these knobs to the faders. Each channel strip is headed by an OLED screen. This displays track information like the current mode or feedback of what is being changed. It also shows if a parameter is assigned to the knob, and a graphical representation of how it is being changed. The quality of these screens sets it apart from the cheaper 8-channel models. This Avid control surface can also be hooked up to an iPad with the free Pro Tools Control app. The iPad's touchscreen interface takes mixing into the future and gives you more real estate for additional visual feedback. Note that as it uses the EUCON control protocol (it also allows HUI and Mackie) it will work with pretty much every major DAW program. However, it connects through Ethernet only, so Apple users may need an adaptor. Bottom Line: This is the cream of the crop for the home recording enthusiast. It's slick, powerful, and above all easy to use. Now, it is pricey, especially when you compare it to something like the Behringer X-Touch, but it can't be touched when it comes to design and functionality. It'll streamline your workflow efficiency like never before. 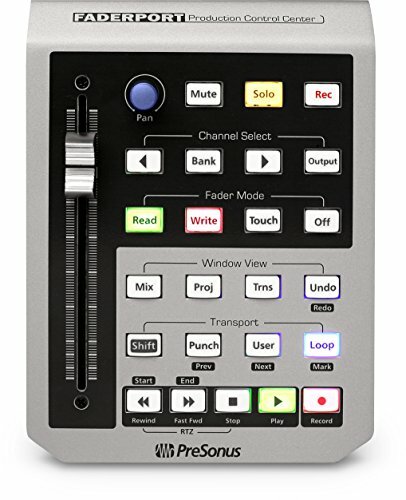 This is also one the best Pro Tools control surfaces out there. The Steinberg CC121 is built for Cubase...and only Cubase. This is the Cubase controller surface of your dreams. If you use this software then stick around, otherwise you might want to give this one a miss. Most DAW control surfaces are built with broad compatibility in mind. They are usually compatible with all the major software on the market, and work pretty well with all of them. However the CC121 is laser focused on working with Cubase. The interface reflects the Cubase software, and will be intuitive to Cubase users. As it was selfishly designed for just one target audience, the level of functionality it brings to Cubase users is beyond anything that the others can offer. This is the big advantage that the CC121 has. The hardware mirrors the software. If you're well versed in working with Cubase then you'll find using this hardware is second nature to you. The hardware/software integration doesn't just stop with the interface design though. There's also the installation process. Well, the lack of one. Plug in the USB connection, and Cubase detects the device upon launch. Simple. The controller can be USB powered by your computer. This is an awesome option for those who record on the move and aren't based in one place. If you need the faders to be motorized you can also plug in the AC adaptor. The CC121 doesn't just keep it simple though. It also innovates. There's the AI Knob, which they call a "point and control" controller. Instead of trying to replace the mouse, they've decided to embrace the freedom of movement that it brings, and enhance it. The ability of a mouse to immediately highlight an area or option on screen is a pretty powerful one. You don't need to traverse any menus and your selection is almost instant. The problem comes when actually changing a parameter. A mouse can be clunky and in-precise. This is where the AI Knob enhances the quality and speed of interaction. Simply move over an area with the mouse, then use the AI Knob to alter the parameters with speed and precision. This little knob makes life so much easier, and you'll wonder where it's been all your life. Another top feature of the CC121 is the EQ section. It has 12 rotary encoders dedicated to this. The frequency, Q-factor, and gain all have their own control for each frequency band. There are also bypass switches, and buttons to select the type of EQ. This is a really cool feature of this controller, and one that's not usually seen on a mixing control surface of this size. Bottom Line: This is the best control surface for Cubase users, and maybe a reason to switch over too. This little box packs an almighty punch and will have you working more efficiently than ever before. If you're buying your first DAW mix controller, or if you're a bit overwhelmed by all the technical jargon, then we're here to help. In this section we outline some of the key features that you should be looking for in your next control surface. We explain the terminology and why these things may (or may not) be important. We also outline some things you should consider before you buy. Buying a mixing control surface can take your recording to the next level, and make the whole process easier, more fun, and especially more efficient. But, it's important to get the surface that suits your level of experience and expertise. Make too big of a jump and you might find yourself overwhelmed by just the sheer number of buttons in front of you. The key thing to remember when buying a DAW controller is that it is essentially a physical hardware reproduction of the software program you see on screen. You want your interaction with the controller to streamline your interaction with the software. 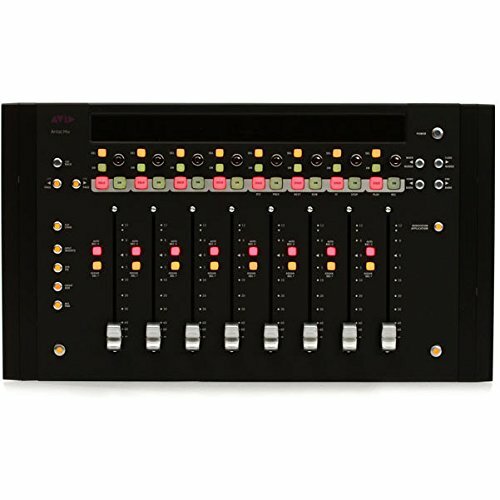 Though they offer a level of control similar to mixers, they don't actually handle or process any audio signals. If you need something that can do this then look for something with audio ins/outs. Some only work with certain DAW software programs. Though this is rarer these days, compatibility can still be an issue. The Cubase CC121 is a fine example of this. This guides for the first time buyers. These are the things to look for when purchasing your first control surface. 1. Which control protocol does it use? Human User Interface (HUI) was created by Mackie and Digidesign in 1997. It was invented so that Pro Tools software and Mackie hardware could integrate better. It is now an industry standard and it's used by pretty much all software and hardware. MCU is another one made by Mackie. It's used in all Mackie control surfaces and is very similar to HUI. This was invented by Euphonix and is now owned by Avid. This is the protocol that is fully backed by Pro Tools. EUCON runs over Ethernet, which makes it much faster than Mackie Control and HUI, which are both MIDI based. This also allows it to run at a higher resolution. This is the only control protocol that allows full integration with Pro Tools. Only EUCON allows full control over plug-ins. An important thing to note is that EUCON can also be used in Mackie Control or HUI mode. This means it still works with all the other DAW software too. Controllers come in a variety of shapes and sizes. If you plan on recording in various locations then something like the Korg or PreSonus models we review would be ideal. However, this smaller size brings limitations and you might be restricted to just one fader. 3. Are the faders motorized? Now these aren't essential, but they will save you a lot of time. Having motorized faders means when switching to the next bank of tracks that the faders will reflect the new positions of the new tracks. The faders will always be at the right position for the selected tracks. Motorized faders make things like drawing automation much easier too. 4. Is it compatible with your software? This point links closely with number one. Most controllers will work with all the major DAWs and this isn't usually an issue. However, there are a few that don't. The Cubase CC121 is one such example. The EUCON control protocol uses Ethernet. If you go with a desk like the Avid Artist Mix, make sure you have an Ethernet connection on your computer (or at least an adaptor). Apple users should pay special attention to this point. 6. How many channels do you need? Consider the type of recordings you will be doing. If you envisage having lots of tracks in your mix then the more channel strips the better. If your recordings are going to be on the smaller size then one fader might be plenty. Channel Strips - these are the individual sections of the controller that each control a separate track on-screen. They work in the same way as a traditional mixer, but instead of the audio signals being routed through, they are just controlling the software. They each include a fader, panning knob, solo and mute buttons, and an EQ in the larger models. Smaller controllers might just have one fader, which can be used to control multiple tracks by skipping through them with the 'bank' and 'nudge' buttons. Transport Buttons - these are the buttons that see the most use. Play, stop, rewind, fast forward, and pause. Scribble Strips - this is the LCD screen that the larger models have at the top of every channel strip. It displays the name you've given each track. When changing parameters like EQ, it can also display the numeric values being changed. Control Protocol - We explain this in detail in point number one in the previous section. But, it's basically the common language that the software and hardware use to communicate with each other. Looking for a new audio interface? Don't miss our new guide! Follow us on Facebook to stay up to date with all the latest news in the recording world. We post facts, guides, and reviews every day that you don't want to miss. Just click the link on the right hand side.